On Wednesday, Bruce Springsteen is releasing his concert from Dublin Ireland earlier this year on CD and in digital formats. Bono appeared at the second concert and is expected to be on the final release. It’s a good time to look back at some of the other appearances of live tracks from the boys in U2, when they have been out and about and doing their own solo things. Over the years they’ve appeared on all kinds of tracks from a range of artists from Kylie Minogue to Pavarotti. And it’s not just Bono who’s gotten into the live appearances, all four members of the band have made guest appearances over the years. The Live Aid concert remained unreleased for years. But in 2004, when the Band Aid 20 single was released, this live performance of “Do They Know It’s Christmas?“ was included as a bonus track on the CD. Larry and Adam did a solo appearance at MTV’s Inaugural Ball for President Bill Clinton in 1993. They joined R.E.M. members Michael Stipe and Mike Mills on stage, and the four performed U2’s “One.” The band combined the names of their most recent albums Automatic for the Baby and Achtung Baby and called themselves “Automatic Baby” for the performance in Washington. Over the years, this track has been contributed to a number of compilations. It first appeared in 1995 on 99X Live X Volume 2 – One Life. A year later the song appeared on the Just Passin’ Thru compilation by WHFS Radio. That same year, it also appeared on the UK compilation Childline. It was last released in September 1997, on a compilation called Amazing Grace, released by Island Records. Automatic Baby was a one time group. Wouldn’t it be fun to see them rejoin forces today? 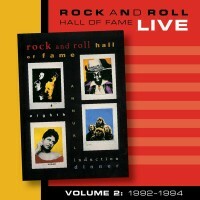 In 2011, the Rock and Roll Hall of Fame opened their vaults and released a number of tracks on iTunes collected into digital volumes. Included in these volumes were a number of U2 related tracks. 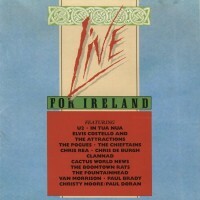 Volume 5 of this digital set includes Bono on stage during a performance by Paul McCartney and others of the song “Let it Be”. This performance was recorded on March 15, 1999. Volume 8 will interest fans the most, as it includes U2’s own performance at the awards ceremony in 2005, and includes all four tracks performed that night. One of my favorite “live” solo appearances was when Bono and the Edge, joined Brian Eno to appear at Pavarotti’s annual Pavarotti and Friends concert in 1995. 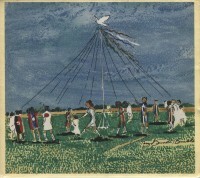 The concert was held in Modena Italy and the proceeds from the concert went to War Child. During the concert Bono and The Edge performed on three songs, “Miss Sarajevo,” “One,” and “Nessun Dorma,” an ensemble singalong at the end of the concert. 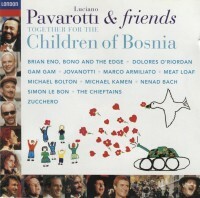 All three of U2’s performances ended up on the “Pavarotti & Friends: Together for the Children of Bosnia“ album but in a rare move, the performance of “One” from the concert was also released on the Passengers single “Miss Sarajevo“. But that wasn’t the only time that Bono would appear with Pavarotti in concert. In 2003 he would appear and sing “One” and “Ave Maria” with Pavarotti. Once again the performance was in Modena and was part of the Pavrotti and Friends series of concerts. But this one did not show up as a straight release of the live track. Instead two years later the song would appear as a B-Side on the single “Sometimes You Can’t Make it On Your Own“. The title song was a song about Bono’s father who Bono has often referenced as an opera singer, and who Bono had introduced to Pavarotti in 1995. The song released was remixed by Jacknife Lee for the inclusion on the single. You can hear the original below, in a clip that follows Bono’s performance of “One”. Bono is probably the most prolific showing up on all kinds of songs over the years, right up to the Springsteen release due on Wednesday. He joined The Corrs on stage for two songs during their “Live in Dublin“ television special filmed in front of a live audience in Dublin. He and Andrea Corr sang two of my favorite Bono solo moments, “Summer Wine” and “When the Stars Go Blue”. He also appeared on stage at the Grammys for an all-star performance of “Across the Universe“, featuring Velvet Revolver with Scott Weiland, Slash from Guns N’ Roses playing guitar, Alison Krauss on fiddle and with Norah Jones, Alicia Keys, Tim McGraw, Steven Tyler of Aerosmith, Brian Wilson of the Beach Boys, Billie Joe Armstrong of Green Day, and Stevie Wonder joining Bono on vocals. The single was released in digital format only and reached number 22 on Billboard’s Hot 100 chart. Bono also joined Kylie Minogue on stage in Sydney during the 2006 Vertigo tour in Australia. The original was a duet between Kylie and Robbie Williams, and “Kids” duked it out with U2’s own “Beautiful Day” being released the same week in the UK. In the end “Beautiful Day” squeaked ahead to take the #1 chart position in the UK that week. Bono struts around and truly looks like he’s enjoying being on stage with Minogue. The duet was released on her “Showgirl: Homecoming Live“ album. Bono has also appeared on stage with his friend Herbert Grönemeyer to perform the song “Mensch”. The live performance appeared on the video “I Walk Live“. Bono also made time in 2005 to show up at a Pearl Jam concert in Toronto, Ontario while the band were there for the Vertigo tour. 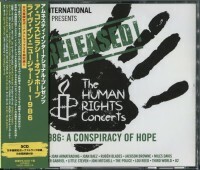 Bono joined Eddie and the band on stage for a rousing version of “Rockin’ in the Free World” and the entire concert was released through Pearl Jam’s own digital store front, which similar to this weeks Springsteen show, was releasing each concert as they happened. There are times I really wish U2 would look at more live releases. Bono and The Edge have also appeared together on a number of projects over the years. The first? More Pearl Jam! During the 2006 leg of the Vertigo tour in Australia, Bono and The Edge joined Pearl Jam on stage for you guessed it…“Rockin’ in the Free World”. (When Pearl Jam opened for U2 in Hawaii at the end of that leg, they came on stage and played “Rockin’ in the Free World” as well.) This version from Australia was released in audio format on Pearl Jam’s annual fan club release, a 7-inch single for “Love, Reign O’er Me“. A video version was also released as an insert in an Australian paper. The group was named U-Jam by Bono during the performance. Stick to singing Bono, and leave the band names to others. Bono and the Edge also teamed up during the “46664” concerts held in 2003 in South Africa. During the performances there they played together on a number of songs including “American Prayer“ featuring Beyonce, and a lovely version of “One” with “Unchained Melody” and “46664“ itself. Bono also appeared solo singing “Amandla“ during the concert. The entire event was released over three CDs (with U2 content on all three) and also on DVD. Bono and The Edge also appeared with Elvis Costello on his television show “Spectacle” filmed in Toronto in 2009 on the eve of the U2360 tour shows there. On the performance Bono and The Edge played a number of songs, some with Costello and his band. The perfomed versions of “Stay (Faraway So Close),” “Two Shots of Happy, One Shot of Sad,” “Stuck in a Moment You Can’t Get Out Of” and also did a performance of Costello’s “Alison.” One final number was a mashup of Costello’s “Pump it Up” with “Get On Your Boots” which is far from my favorite version, but we’ve included it below for you to make up your own minds. And if you’re looking for more of The Edge, don’t forget his work on “Stranded” with Bono, Jay-Z, and Rihanna on the “Hope for Haiti“ project. The Edge also performed on his own with Stevie Wonder, Natasha Bedingfield, Leona Lewis, Martina McBride and Aaron Neville on the “Stand Up To Cancer“ benefit in 2010. The Springsteen concert recorded in Dublin this year will be released on Wednesday. You can find out more about this release here Let us know on Facebook or Twitter or in our forums which of these live performances are your favorites!